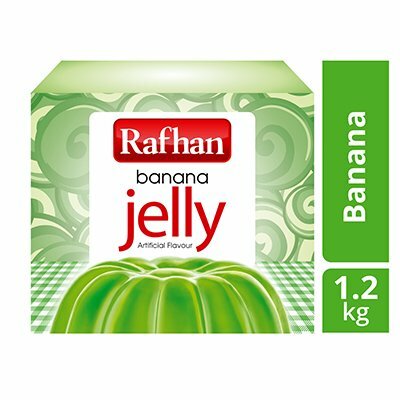 Banana flavored mixture for convenient jelly preparation. It is used in various desserts for decorative purpose. Contains Milk & products of these. • Boil 1 Liter (1000 ml) water in a saucepan. Measure water exactly. • Pour 200 gm jelly content in boiling water, while stirring continuously. • Pour the mixture into a mould and allow to set for 45-60 minutes at room temperature or cool in refrigerator. • Separate jelly from sides of the mould with knife, gently shake and invert mould carefully over serving dish. After cooking the jelly, let it cool for 5-6 minutes at room temperature before refrigerating it for shape setting.